Robert Bruce states that as “a student of heredity, Bell could not resist moving beyond statistics to experimentation.” Sheep breeding and heredity experiments on white cats fuelled Bell’s wistful ambition to be an active, publishing and professional scientist. Word of Bell’s breeding experiments eventually reached Charles Benedict Davenport, spokesman of American eugenics and its spiritual head, and the two men engaged in lengthy correspondence. By merging Galtonian eugenics with Mendelian heredity, the new American eugenics under Davenport’s leadership focused as “the science of the improvement of the human race by better breeding” and gave an institutional base for the movement with the establishment of the Carnegie Institution’s Station for the Study of Experimental Evolution (SEE), and the Eugenics Record Office (ERO) at Cold Spring Harbour in Long Island, New York. These research bodies sought to apply scientific breakthroughs in heredity and eugenics to human affairs in order to purify the American population. Layers of scientific veneer provided prestige to the movement as the most brilliant minds o the country were recruited into the movement: Harry Hamilton Laughlin, David Starr Jordan (1861-1961), Vernon Kellogg (1867-1937), among others were all active participants. As well, the American Breeders Association (ABA) Committee on Eugenics served as the nucleus for the ERO, and guided the direction of the movement. The ABA Committee and the ERO represented a virtual “interlocking directorate” of American eugenics, and their leadership in a variety of associations, institutions, and committees would continue to lead organized American eugenics well into the 1930s. With Davenport’s connections, Bell obtained sole autonomy to manage the American Breeders’ Association Subcommittee on Hereditary Deaf-Mutism and the ERO’s Committee on Hereditary Deafness. Additionally, Bell served as Chairman of the Scientific Board of Advisors to the ERO from 1912 to 1917. However, as early as 1915, Bell betrayed some uneasiness about what he called “our eugenic cranks.” While Davenport and the other eugenicists focused their research on the implications of eugenics findings for social policy, Bell’s ideas on heredity and eugenics remained consistently positive. 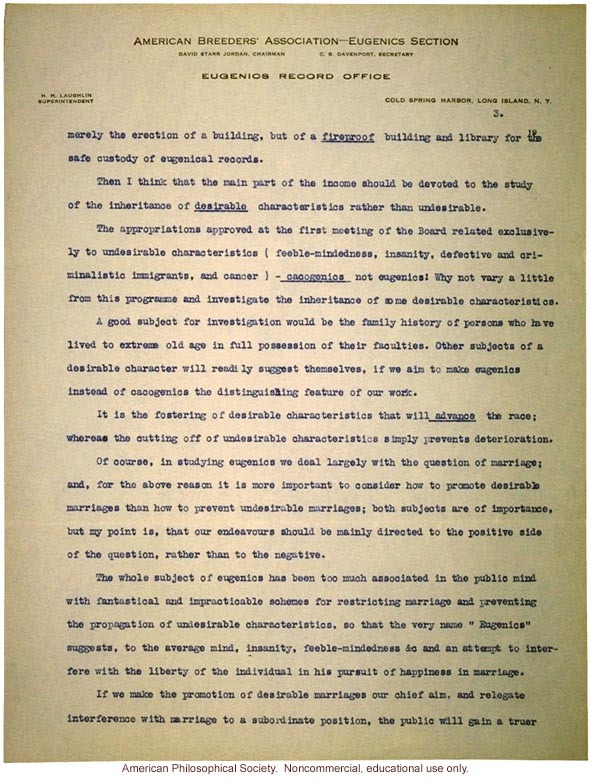 Opposing any scientific interference with the marriages of “undesirables,” Bell denied that such marriages could significantly affect the quality of the human race, a stark contrast to his earlier anxieties of the threat of a “deaf variety.” Bell the eugenicist during the twentieth century was more interested in the science of heredity than racial ideology, though he still continued to emphasize the importance of education, writing that “individuals have power to improve the race, but not the knowledge of what to do.” By disseminating knowledge about heredity and the consequences of ill-chosen marriages, bell believed eugenics could meet its goal for improving the American population. Accordingly, for Bell, the goal of eugenics was not to “eliminate” the likelihood of hereditary deafness along with other “undesirables,” but rather “meant scientific research and discovery, the dissemination of which might encourage those with ‘desirable’ heredity to marry one another for the sake of their own posterity as well as the improvement of the human race” (emphasis mine). The appropriations approved at the first meeting of the Board related exclusively to undesirable characteristics…—cacogenics not eugenicial: Why not vary a little from this programme and investigate the inheritance of some desirable characteristics…It is the fostering of desirable characteristics that will advance the race; whereas the cutting off of our undesirable characteristics simply prevents deterioration. Like Galton before him, Bell was a firm believer on the proliferation of desirable traits and spent much of his years as Chairman for the Board trying to promote positive eugenics. As an active participant in the eugenics movement, Bell also constructed a new twentieth century perspective of the deaf that disregarded the notion of deafness as a disability. Whether it was from his observations of the “feeble-minded,” the “criminals,” or other “undesirables,” Bell did not contend that the deaf fell into the same category and could thus be exempt from the same eugenics measures. The deaf were different he insisted, because they had the tools necessary for normalization—oralism—and could thus be educated to avoid contributing to the degeneration of the human race. Jan Branson and Don Miller assert that eugenic measures imposed upon the deaf and other “undesirables” were related in part, to the social construction of deaf people as disabled. Eugenics was a prime ideological force constructing deafness as a medical pathology, but the attitudes and demands from the movement did contribute significantly to how scientists viewed the “unfit.” Building upon Charles Rosenberg’s argument that social attitudes can directly influence the direction of (social) science, it is likely that Bell’s experiences with the eugenics movement and his intimate relationship with the deaf community turned him away from popularized perceptions of the deaf. In doing so, Bell not only shaped, but also deconstructed the notion of deafness as a disability by insisting their “defect” could be “corrected” through normalization. His feeling of social responsibility and paternalistic stance towards the deaf community also contributed to his need to reinforce a certain conceptualization of the deaf apart from the eugenicists’ classification of “undesirables.” Bell eventually discovered his insistence for positive eugenics could only go so far to deter the ambitions of negative eugenicists. C.B. Davenport, Heredity in Relation to Eugenics (London: Williams & Norgate, 1911), p.1. S. Selden, Inheriting Shame; The Story of Eugenics and Racism in America (New York & London: Teachers College Press, 1999). The ABA’s Committee on Eugenics categorized the “socially unfit” into ten subcommittees dealing with a pertinent issue requiring qualified scientific expertise. The ten committees were the Committees on (1) Heredity of Feeblemindness, (2) Heredity of Insanity, (3) Heredity of Epilepsy, (4) Heredity of Criminality, (5) Heredity of Deafmutism, (6), Heredity of Eye Defects, (7) Sterilization and Other Means of Eliminating Defective Germ-Plasm, (8), Genealogy, (9) Inheritance of Mental Traits, and (10) Immigration. The board also included William H. Welch (vice-chairman), Irving Fisher, Lewellys F. Barker, Thomas Hunt Morgan, and E.E. Southard. Quoted in Haller, Eugenics, p.81. Quoted in Selden, Inheriting Shame, p.1. Greenwald, “The Real ‘Toll’ of A.G. Bell,” p.38. A.G. Bell, “Letter to Charles Davenport about Eugenics Record Office” (December 27, 1912). American Philosophical Society, Dav, B:D27., Harriman, Mrs. E.H.
 Bruce writes: “Bell did yield to the assumption, which all those around him took as axiomatic, that ethnic groups somehow differed inherently in temperament and intelligence, as well as in superficial physical characteristics. But he considered such presumed differences irrelevant to the inheritance of deafness, which was his chief concern. And to the end of his life he escaped the fatal delusion of more and more eugenists that they knew just what those supposed ethnic differences were, quite without benefit of scientific study, and could sort them out as “desirable” or “undesirable.” Bell never singled out any specific ethnic group as “undesirable,” though it was commonplace in his day for self-styled eugenicists to stigmatize the Italians, Jews, Slavs, and others. In his published writings on eugenics, he alluded only vaguely and causally to restriction of immigration on eugenic grounds, and then only to the extent of insisting that careful, objective studies ought to be made before any groups were presumed to be “undesirable” by heredity and therefore shut out [my emphasis]” (Bell, p.418). C.E. Rosenberg, “Science and American Social Thought.” In Science and Society in the United States, eds. David D. Van Tassell and Michael G. Hall (Homewood, Illinois: The Dorsey Press, 1966), 135-162. Bell, quoted in Black, War Against the Weak, p.101. Bell, quoted in Black, War Against the Weak, p.104. Black, War Against the Weak , p.104. Bell, quoted in Black, War Against the Weak, p.105.